The other day, I went out to lunch with my friend Aaron at Cafe Colonial on Houston Street. He works around there, but I’d really chosen the venue because of the veggie burger they have on the menu. Though veggie burgers with sweet potato fries might be my ideal lunch, I’m oddly not so picky about what the burgers actually are like. They come in such varieties, but with some ketchup, pickles, and even avocado, I find them good almost across the board. This nonjudgmental attitude was doing me no good when I picked up the menu at lunch though. There was no veggie burger with fries on it at all. There was only one dish that seemed it might meet my expectations, described as black eyed pea patties over a salad with yucca fries. I ordered it, but only after begging the waitress to serve it to me on a bun with all the fixings (she didn’t seem to want to). I asked Aaron, “Where’d the veggie burger go?” and he said, “I don’t know! You chose the place.” “Right,” I said stupidly. Anyway, when the patties I ordered arrived, I took one bite of them and was reminded in both taste and texture of these Sweet Potato Black Bean Burgers, which I had made the week before (including the sweet potato in the burger, since I wasn’t going to make fries for one). And in spite of my disappointment at not having been served the lunch of my dreams, I was happy to be in for a revelation: these soft, crispy-exterior types of burgers may actually taste better on salad than on bread. The “type” is not the chewy, meat-like sort of veggie burgers that contrasts well with the consistency of the bun. It is more bean-y than that, along the lines of these sweet potato-squash croquettes, and is quite well served by the crunch of the lettuce underneath. I made these pre-Cafe Colonial revelation, so I served them with toasted bread. If you don’t have any lettuce on hand, just toast the bread to achieve a nice contrast between crunch and softness. You can also shape these into smaller balls and serve them as appetizers, like Phoebe’s black bean cakes, found here. Bring a pot of salted water to the boil. Add the sweet potatoes and cook until they are soft, about 10 minutes. Drain and cool until they’re not painful to handle. Meanwhile, heat 1/2 teaspoon olive oil in a small skillet. Cook the onion and celery for a minute or two over very low heat, then add the garlic. Saute until the vegetables are soft but not browned. Add the spices and pinch of salt, then add the black beans and a tablespoon or so of their water. Cook down for another few minutes, then transfer about 2/3 of this mixture to a food processor. Add the sweet potatoes, flour, and fresh cilantro if using, then processor until mainly smooth. Mix in the reserved black beans from the skillet for added texture. Warm the remaining 1 1/2 teaspoons in a skillet over medium heat. Form the sweet potato-bean mixture into two 4″ patties, then cook until crispy and brown on each side (about 5 minutes each), flipping once. Serve over greens (it will wilt them a bit) or on toast. Would roasting the sweet potatoes instead of boiling work? I'm always hesitant to boil vegetables because I feel like they lose some of their taste, and too many of their nutrients. These do sound delicious, and I am with you on the sweet potato fries–there is little better in the world then perfect sweet potato fries! Ooh! The taste and texture combo sounds soo good, and it's basically a pantry dish, too (well, if you have sweet potatos around)! Must try. Your posts have been a little meat heavy these days, so I'm happy to see a veggie burger. Unfortunately, I don't like sweet potatoes. What do you think of carrots as a substitute? Sara–the taste of the sweet potato is mainly overwhelmed by the black beans and the spices. Because it acts as a binder, I don't think I'd substitute carrots. Rather, try white potatoes, if you like those. Other starchy, binding options include grains such as rice or quinoa. Kate–yes, you could certainly roast the sweet potatoes for a stronger taste (just don't serve them to Sara then). But boiling them saves on time, if that's an issue. Thanks. I forgot to say that I don't really like black beans either, so I would probably use lentils or chickpeas as a substitute. Actually, a lentil/quinoa burger sounds good, don't you think? This is the first time a recipe I made from this blog has not worked, but oh, did this one not work for me. I followed the directions pretty precisely, although I didn't exactly measure the beans or flour, but I absolutely could not make anything remotely resembling a burger out of the bean-sweet potato paste I ended up with. I forlornly tried cooking dollops of it, somewhat the way I'd cook pancakes, but they never turned into anything other than warmer mush. 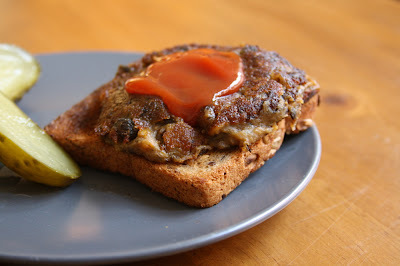 That said, the mush tasted pretty good – I could see spreading it on toast or maybe even using as a condiment on a sandwich – but I'm wondering if anyone has any tips as to how to make it become a patty. Bread crumbs? Egg? Anyone? Becca–I'm so sorry to hear that the recipe didn't turn out. It is possible that the sweet potatoes carried some extra moisture (or that the beans did…). But the easiest remedy would be to add some more flour or some breadcrumbs. That being said, this batter is definitely on the mushy side. Just fling it onto the baking sheet or into a pan, and it'll firm up as it cooks. I'm wondering what kind of black beans you used…were they the s&w canned kind or do you just throw dry black beans into it?? Really sorry to hear this – I’ll retest them as soon as I can. In the meantime, refrigerating the batter before making the cakes can really help.